The primary garment is the tunic. Its skirt comes to the knee cap or just above and it’s always worn tight to the forearm and wrist. Neck-holes are either round, oval or v-shaped, and can have a keyhole opening. Decoration, in the form of facings, embroidery or tablet weave, can be applied to the cuffs and neck-hole but not around the hem of the skirt. Tunics are usually made from wool but can also be from linen. Belts can be made from either braided wool or from a leather strap. They can be simply tied or else closed by a buckle of bone, iron or copper-alloy. Belts often have strap-ends attached. For warmth a cloak can be worn, clasped on the right-hand shoulder by ties or a large disc brooch or pin. Leg coverings, if worn at all, should be tight to the leg and can be hose and braies or trousers. Leg wraps can also be worn. These are long strips of 10cm wide woollen cloth worn wound about the lower leg from the ankle to the knee. Shoes are of the simple, two-part turn shoe construction and are usually low, coming to below the ankle. Jewellery is often of copper-alloy although silver and gilt brooches are worn by those that can afford them. The Winchester style is common with the Viking introduced Borre and Jelling styles used in some parts of the country. 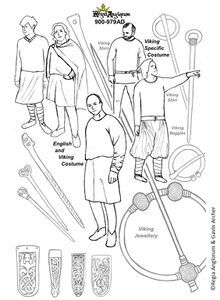 Viking men’s fashion of the 10th century varies little from that of the English and does not change as dramatically as it does for women. 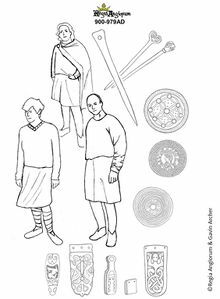 Viking men from England are quick to adopt more Christian fashions such as disc brooches and hose and braies. The main item of clothing is the knee length tunic and other than decorative fashion and jewellery it would be hard to tell a Viking from an Englishman. Neck-holes are either round, oval or v-shaped, and can have a keyhole opening. Decoration usually in the form of facings, embroidery and tablet weave can be applied to the cuffs and around the neck-hole. For warmth a cloak can be worn, clasped on the right-hand shoulder by ties or a large pin or penannular. Some Anglo-Danes may wear disc brooches like the English. Leg coverings, if worn at all, are usually trousers, but hose and braies are being adopted, even in the Viking homelands. Leg bindings can also be worn. These are long strips of 10cm wide woollen cloth worn wound about the lower leg from the ankle to the knee. Pagan first generation settlers and pagan Viking visitors can still be seen wearing traditional male Viking costume like that of the 9th century, although this becomes less common as the period progresses, as even in Denmark and Norway there is a growing number of Christian converts. Men tend to wear little artistic jewellery, instead mainly wearing simple decorated pins or penannulars. Ring money is worn in the shape of twisted silver neck torcs and arm rings. Some imported jewellery styles have however been adopted such as the Irish style silver Thistle brooches and some Anglo-Danes are now wearing the English style disk brooch. Regia members can discuss this on the Regia Members Info group. This page was last modified on 21 January 2018, at 19:58.